The Resorts are located at places that have been carefully chosen to reflect the beauty of nature. Known for their serene environment, they are situated in the quiet and verdant terrains of Kabini, Masinagudi and the suburbs of Bangalore. The lush gardens and tranquil air allow guests to unwind and relax on their retreats. The vast area of the resort also allows a large group of people to come together, by escaping the mundane of everyday life and getting to know each other. Discovery Village has been uniquely designed to bring guests close to their adventurous side. The different resorts are located around popular tourist’s spots that offer a wide variety of adventure activities that are specific to that particular area. Guest can trek through the verdant slopes of Nandi hills while they are enjoying a stay at the Discovery village resorts in Nandi Hills. They can go kayaking, canoeing or parasailing in Kabini or go hiking if they are in Masinagudi. The outdoor locations are ideal to have fun with outdoor games as well. All the resorts belonging to discovery village offer a wide range of activities that can be enjoyed with workmates and colleagues. They have team building activities that help in enhancing the skills of people. The activities and events also help in nurturing creativity and building smooth communication channels. Ice-breaking sessions are also part of the team-outing packages that these resorts offer. These small events also hone skills of planning and leadership. Apart from the activities, there are numerous games and adventure activities that people can try. Indoor and outdoor games are offered for teams. Along with these fun-filled events and activities, the destination is also quite popular amongst zorbing enthusiasts who can experience it with their team-mates. The Discovery Village resort allows teams, who are out on an off-site retreat from work, to have the best culinary experience while they enjoy their time in the resort. The kitchens are equipped to serve sumptuous meals that are healthy and tasteful. The meals are power-packed with nutrients that allow people to be energetic while participating in various adventure activities. The best part about the cuisine at Discovery Village is that it is prepared from carefully chosen organic ingredients that are grown locally. They also offer a platter of all the local dishes that guests can give a try. Are these luxurious resorts calling out to you? Well, you can always plan your office year-end parties to experience the paradisiac amalgamation of nature, and its impressive elements at Discovery Village. 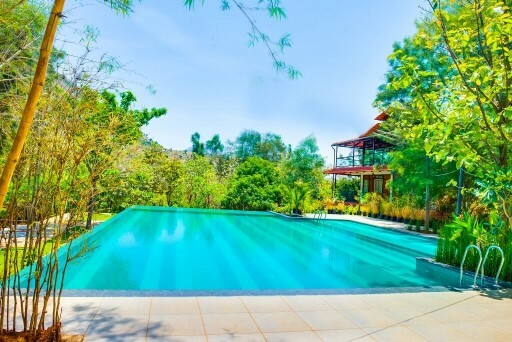 So, the next time you think you need a break from the monotonous routine of your daily life, book a stay at this eco-friendly resort and have the time of your life.